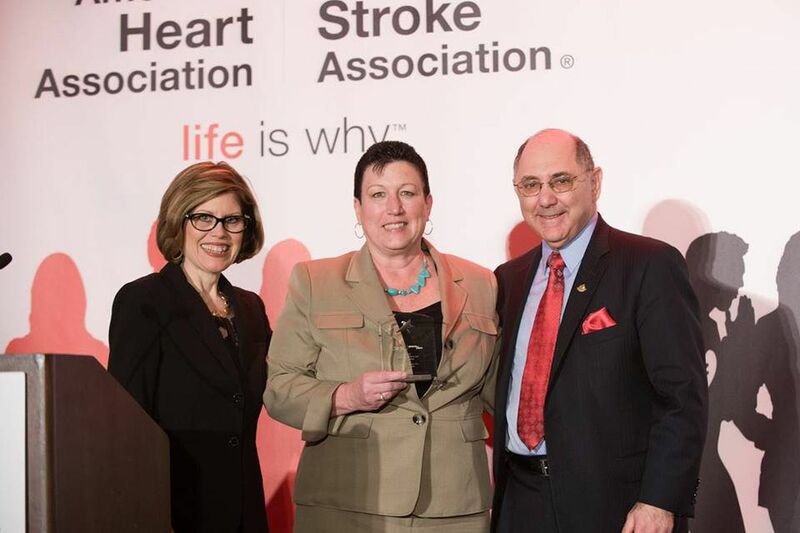 Theresa Conejo, at center, was recently honored by the American Heart Association. With her are heart association CEO Nancy Brown and past president Elliott Antnan M.D. When Theresa Conejo's mother was just 56, she suffered a stroke. Eventually, she was well enough to start rehabilitation, but the insurance company would pay only for outpatient treatment — meaning she had to go home before she was well enough to care for herself. Conejo quit her job and moved in with her mother. It was difficult. She had a son in kindergarten. "But, being so young, my mom had a full lifetime ahead of her. I wanted to do all I could," Conejo recalled recently. "It took a full year, but we got her back to where she could be more independent." She credits that experience – 25 years ago – with sparking her interest in cardiology and strokes. Now Conejo, a registered nurse who lives in Bensalem, is the heart failure coordinator at Nazareth Hospital, tasked with making sure that patients have all the resources and education they need to go home and continue recovering. She also does volunteer work. In June she traveled to Dallas to accept one of the numerous awards she has won, including her fifth from the American Heart Association, which named her Healthcare Volunteer of the Year. She serves on the heart association's Minority Affairs Council, and has pushed for state and federal laws to better address health disparities. She spoke to us recently about health challenges in the Hispanic community. Theresa Conejo represented the American Heart Association at a Texas conference of Salud America, which promotes healthy weight and eating behaviors for Latino children through empowerment and healthy changes in schools and the community. What are some of the health-related disparities you see? We have socioeconomic issues. A lack of jobs. A lack of medical knowledge. Some may not have access to fresh, healthy foods. They may live in a food desert. There's also the issue of access to care. If the Affordable Care Act is repealed, we are going to have more people lacking health insurance. People may not be able to go and get the preventive care or medication that they need. We had a scenario where a woman who was five months pregnant with her third child was having dizziness and signs and symptoms of a stroke. She went to a local clinic. But she spoke only Spanish, and they didn't have a translator or a translator phone. For some reason, they sent her home. She went back a second time. They sent her home again. The third day, she had a hemorrhagic stroke. She and the baby died. This rocked the community. She was 30 years old. But she couldn't get her needs met because of the language barrier. On the other end, the physician couldn't understand what the patient was trying to get across. That was a hard scenario. It actually scared the ladies in the community. They didn't want to go to the clinic, and the clinic was a plus for the health of the community. We concentrated on the positive, not the negative, and did a health event. We brought the ladies together, in honor of this young lady. We spoke to the women about the signs and symptoms of stroke, how to be their own advocate, how to demand a translator. This is a matter of life and death, and you have that right to language access. You mentioned a translator phone. What's that? It's a special phone that connects to a translation service. You dial a number and get a recording that asks what language you want. Within three minutes, a professional translator is on the other end of the line. The phone in our health-care facility has two headsets, for the patient and the provider. It's so simple. I feel that all health-care facilities – hospitals, clinics, doctors' offices – should have them. You're serving the public. And for some facilities, it's the law. Organizations that receive federal funds are prohibited from discriminating based on national origin or language. This makes it easier for us, too. Then I know that the patient understands fully what's going on, what they need to do. As a patient, if you feel that someone is saying something to you that you don't understand, or if you are asked to signed papers that you don't understand, you have that right to ask for a translator. What are some of the other biggest needs for the Hispanic community? We lack bilingual educational materials. We could do better by having bilingual and bicultural employees, particularly nurses and doctors. We need to reach out and encourage our young people to come into the field. The National Association of Hispanic Nurses is very good at mentoring young nurses. We need more Latino representation on boards, as well. The Latino community is very family-oriented. We have to be mindful of that when we speak to the patient, and include the family, as well. There's a need for more cultural competency. Many facilities and organizations are doing a good job of it. We just need more. We need to extend hours of service. Most of the Latino community rely on their husbands or someone else to drive them to their appointments. They work long hours. So we need more evening and weekend hours. We need to work through the churches, the faith-based organizations, social organizations. There's a lot out there. We just need to work with each other. Someone approaches me about housing, and I say, "oh, I know an organization that can help you." I think of myself as a navigator. I feel that I understand the health priorities of the Latino community. I have a feel for the challenges they face. Overall, we need to increase the awareness of heart disease and the risk factors. Heart disease is the No. 1 killer of all women. But Latina women seem to have heart disease younger than white and African American women, and the outcomes are more severe. You've helped organize an annual "AHA Latina Luncheon" in the region. Tell us about that. We usually hold it in the North Philadelphia area, and it's an event where we have all kinds of vendors who do all kinds of screenings, blood pressure, cholesterol, etc. We talk about nutrition, have cooking demonstrations, give out healthy recipes. We do provide a heart-healthy lunch. Sometimes we have a yoga demonstration or a Zumba demonstration. We have a survivor come and speak – "this happened to me, and now I've changed my lifestyle." We always wanted to run a public service announcement to start off the luncheon, but we never had one in Spanish. Now we do. It's also important to have Latino actors. With one CPR film, it was dubbed. People laughed and didn't take the message as seriously. So now they're getting Spanish-speaking people to do the videos. These are things we don't think about, but they're important. Tell me about a recent moment that told you all this was worthwhile. I had a patient, a Latino woman in her 70s. She was diabetic and had hypertension and heart disease. She lived with her daughter. She wasn't following the directions as far as eating, fluid restriction, snacks, etc. I had to sit down with her, her daughter, and her grandson. I had to take it down to meal-by-meal: "Tell me what you eat. How do you prepare that rice and beans? Did you know Goya has low-sodium foods?" To just go in and say "don't eat this and this" wouldn't work. I had to find out exactly what her diet is. And being familiar with Hispanic foods and the dishes, I was able to work with her to make it more heart-healthy. Cultural competency is not just being able to speak the language. It's also knowing the culture, the food preferences. Yes, you can have your favorite dish that grandmom gave you the recipe for, but you can tweak it a little bit, and it will be heart-healthier and tasty. She actually did stay out of the hospital and did cook some food. She brought it in and shared it with me. It was a rice and beans and chicken dish: Arroz con gandules y pollo.